According to them, the explosion has been targeted at a NGO vehicle and only the officials of the organization got minor injuries. The news items failed to explain why anybody would waste its precious resources and time and taking life threatening risks to target a NGO vehicle and inflict minor injuries! But mystery surrounds the blast since the LTTE media like the Tamil Net reported only about the three NGO workers who were injured with their driver. According to other sources, there were also five LTTE cadres who were killed in the explosion but there wasn’t a single word about that in the Tamil Net. But the government controlled Daily News said in the same blast the NGO officials of the North East Irrigated Agriculture Project got injured, the LTTE cadres traveling in another vehicle with NGO markings in front of that vehicle got killed. The Tamil Net said the Claymore explosion took place in Kokupadaiyan, 28 km southeast of Mannar town, July 20 around 2:45 p.m. “The incident took place on Silivathurai - Mullikulam Road between Kallaru and Kokupadaiyan, the website said. The place is inside the LTTE controlled area. Did the LTTE guerillas get killed or didn’t they? Usually the LTTE would not admit such a large number of them died in an army organized explosion. The army also would not say anything about it since it’s a violation of the ceasefire agreement to go inside LTTE territory and described it as a LTTE claymore explosion. It said, “Four employees attached to a World Bank Funded Project Operating in uncleared areas of Mannar under NEIAP organization were injured in an LTTE activated claymore mine blast Thursday (20) afternoon KOKKUPADAYAN. To prove their version five LTTE guerillas cannot die if the mine was activated by the LTTE. So, they also could not tell anything about the five deaths of the guerillas, either. The conflicting reports would also indicate the LTTE’s great worry about a Deep Penetration Unit of the Army. Is there such a unit? Or, is there some other group attacking Prabhakaran with the help of RAW, maybe? Whatever it is the five deaths of Tigers will remain a mystery for now. 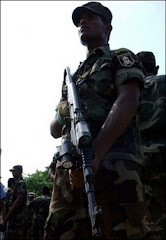 In a different news item on the same day the Tamil Net, said in the LTTE controlled Semamadu in Vavuniya district three members of their auxiliary army were injured by a claymore mine explosion of Sri Lanka Army’s Deep Penetration Unit. Like many of the Sri Lanka Army soldiers who get injured by claymore mines they were also injured while being engaged in road clearing duties. How similar! Are the Tamil Tigers getting a dose of their own medicine?